Capital One has been a leading provider of financial products for decades. Their most popular products include a broad range of credit cards designed to serve the needs of any consumer whether you prefer to earn cash back or miles, or need some help building or repairing your credit rating. As part of its motto to provide “no hassle” rewards, Capital One has also been a leader in providing an online application process for their credit cards a simple and smooth process. You can also compare credit cards and examine specific features if you aren’t yet sure which one you like the most. No matter the type of card you need for your circumstances, there’s a good chance you’ll find one that works for you with Capital One. One of the best features of Capital One’s application process is the ability, in many cases, to apply online and receive either an approval or denial instantly. In fact, if you aren’t quite ready to add an inquiry to your credit report or you aren’t sure which card suits your needs best, you can even pre-qualify online, and Capital One will help you figure out which card you should consider. For the most part, to apply for Capital One credit cards, you simply select the card you want to apply for or select the option to see if you pre-qualify. Capital One provides a number of different high-quality types of credit cards. Because of its mission to provide no hassle rewards, these are often some of the most popular. Capital One rewards credit cards such as the Capital One® Venture® Rewards and Capital One® Quicksilver® Cash Rewards are some of the highest rated on the market. Further, whether you are a small business owner, a student, or in the process of rebuilding your credit, Capital One credit cards are some of the best available. The Capital One® Quicksilver® Cash Rewards Credit Card currently offers 0% intro APR on balance transfers and purchases for 15 months. The variable APR after the intro period is 16.24%-26.24%. There is a 3% balance transfer fee on the amount you transfer within the first 15 months. New cardholders also get a one-time cash bonus of $150 after spending $500 on purchases within 3 months from account opening. This card awards unlimited 1.5% cash back on every purchase. There is no annual fee. 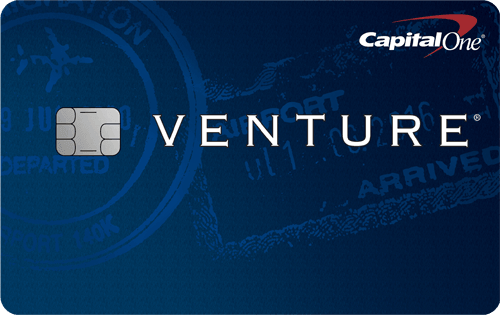 The Capital One® Venture® Rewards Credit Card offers unlimited 2x miles for every dollar spent on all purchases and unlimited 10x miles on hotels through January 2020 when you pay with your Venture card at hotels.com/Venture. You can redeem miles for statement credit against a wide variety of travel purchases and transfer them to more than 12 travel loyalty programs. The variable APR for purchases and balance transfers is 17.99%-25.24%. New cardholders get 50,000 miles as a one-time bonus if you spend $3,000 within 3 months of account opening, which can be worth $500 in travel. Plus, receive up to $100 application fee credit for Global Entry or TSA Pre✓®. The annual fee of $95 is waived the first year. 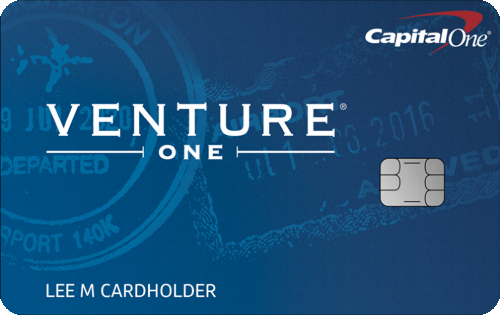 The Capital One® VentureOne® Rewards Credit Card offers 0% introductory APR on purchases for 12 months; after the intro period, a variable APR of 14.24%-24.24% applies. The APR for balance transfers is 14.24%-24.24% variable. You get unlimited 1.25x miles for each dollar spent on all purchases made with the card and unlimited 10x miles through January 2020 on hotels when you pay with your VentureOne card at hotels.com/Venture. You can redeem miles for statement credit toward travel purchases and transfer them to more than 12 travel loyalty programs. New cardholders can receive a one-time bonus of 20,000 miles (worth $200 in travel) if you spend $1,000 in purchases within 3 months from account opening. There is no annual fee. If you have “average” credit, the Capital One® QuicksilverOne® Cash Rewards Credit Card offers unlimited 1.5% cash back on all purchases without any changing categories. The APR for balance transfers and purchases is 26.96% variable. The annual fee is $39. Click here to learn more and apply for the Capital One® QuicksilverOne® Cash Rewards Credit Card today! The Capital One® Platinum Credit Card offers a variable APR of 26.96% for purchases and balance transfers with no annual fee. If you have an average credit rating, this card is a solid option for building or rebuilding your credit with an unsecured credit card. It offers access to your credit score, and when you make your first five monthly payments on time, you can qualify for a credit limit increase. Building credit is a little easier with the Capital One® Secured Mastercard®. Based on your credit worthiness, your security deposit of $49, $99, or $200 can get you a credit card with an initial $200 credit limit. You can improve your credit rating as you make your payments on time and manage your account responsibly, and you can also get access to a higher credit line after making your first 5 monthly payments on time with no additional deposit needed. The variable APR is 26.99%. There is no annual fee. The Capital One® Spark® Cash for Business awards small business owners unlimited 2% cash back on all purchases made with the credit card. The variable APR for purchases is 19.24%. New cardmembers can earn a one-time $500 cash bonus after you spend $4,500 on purchases within 3 months from account opening. There is no additional cost for employee cards. The annual fee of $95 is waived the first year. The Capital One® Spark® Cash Select for Business awards unlimited 1.5% cash back on all purchases with a one-time bonus of $200 cash if you spend $3,000 with your card within 3 months from account opening. There is a 0% intro APR on purchases for 9 months. After that, the variable APR is 15.24%-23.24%. Employee cards come with no additional cost. This card has no annual fee. 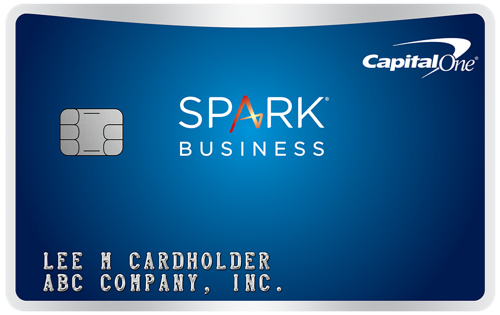 Click here to learn more and apply for the Capital One® Spark® Cash Select for Business today! You get two miles for every dollar spent on all purchases with the Capital One® Spark® Miles for Business credit card. New cardmembers can earn a one-time bonus of 50,000 miles after spending $4,500 on purchases within the first 3 months of account opening. The variable APR is 19.24%. The annual fee of $95 is waived the first year. 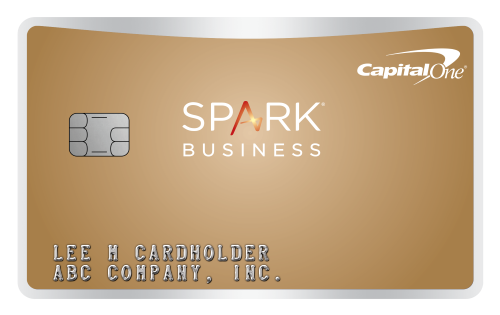 Click here to learn more and apply for the Capital One® Spark® Miles for Business today! You get 1.5 miles per dollar on all purchases with the Capital One® Spark® Miles Select for Business card. New cardholders get a one-time bonus of 20,000 miles worth $200 in travel if you make $3,000 in purchases with your card within 3 months from account opening. You also get a 0% intro APR on purchases for 9 months, and then 15.24%-23.24% variable APR afterward. The Capital One® Spark® Classic for Business offers small business owners 1% cash back for all purchases made with the card. This card is designed to assist you in building and strengthening credit for your business. The variable APR is 25.24%. There is no annual fee for this card. Click here to learn more and apply for the Capital One® Spark® Classic for Business today! College students who are just starting out in the world of credit can begin building their credit score with the Journey® Student Rewards from Capital One®. This card awards 1% cash back on all purchases. Plus, if you pay on time, your cash back increases to 1.25% for that month. After you make your first 5 monthly payments on time, you may qualify for a higher credit line. The variable APR for purchases and balance transfers is 26.96%. There is no annual fee, balance transfer fee, or foreign transaction fee with this card. 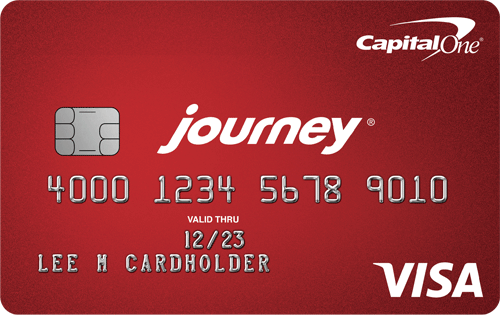 Click here to learn more and apply for the Journey® Student Rewards from Capital One® Credit Card today! Internet – Our Recommended Option. 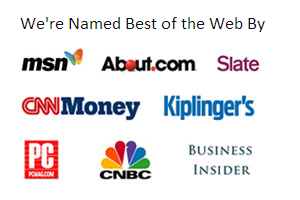 It’s no secret that the easiest and quickest way to get information on any topic is via the Internet. With credit cards, specifically, you will find the most up-to-date promotions and special offers online. Plus, you can then apply for the card promotion and receive a reply almost immediately, decreasing the chances you’ll miss out on valuable offers. In order to catch and take advantage of the best credit card offers, you’ll need to check online. Mail Offers. Although the Internet has seemingly taken over product promotions, print and mail offers are not dead and still provide value that deserves consideration. Before tossing your mail offers in the trash, make sure you take a look at special preapproved or prequalified offers that might include extra deals and savings. Also, note any exclusive reservation numbers and invitation codes that are provided because you won’t always have access to these offers with other promotions. It’s important to keep in mind, however, that mail offers often include links to apply to sites such as application.capitalone.com. If you want to ensure you get the best promotion and offer, be sure to compare offers to other credit cards and research what is available before applying. TV. You’re likely familiar with Samuel L. Jackson and Alec Baldwin’s question, “What’s in your wallet?” Television ads are one of the more fun and interesting ways to catch special Capital One offers and new credit card promotions. TV ads usually include a phone number or link to apply for the credit card advertised, but this method doesn’t allow you an opportunity to research or compare the offer with other credit cards. Television ads are effective vehicles for letting you know what’s new, but there is a risk of missing out on a better offer with another credit card that might award you more. For this reason, it’s still recommended that you take a quick look at what’s out there before picking up the phone and signing up. Magazines/Newspapers. A large number of magazines and newspapers still include credit card advertisements and promotions. Capital One often runs extra deals and credit card offers in a variety of print publications, typically including a phone number or directions to apply at the website CapitalOne.com. This isn’t always the best way to catch special promotions, but it is an important one you’ll probably encounter. Bank Branches. Not everyone is aware that Capital One and other credit card issuers have actual bank branches. Capital One, for instance, has branches in a number of areas, including District of Columbia, New Jersey, New York, and Texas. If you are near one of these branches, you can find out which types of credit card promotions are available and, if you are already a customer, possibly taking advantage of other offers. For instance, if you have a checking or savings account, car loan, or mortgage with Capital One, you may be able to combine accounts and have access to other features with your credit cards. Capital One is now the first major bank to offer a credit monitoring tool free for everyone. With CreditWise, you get unlimited access to check and monitor your TransUnion Vantage credit score. This interactive app and online tool is free to use whether you are a Capital One cardholder or not, and includes weekly updates of your score as well as a credit simulator to give you an idea how your actions will affect you before you actually make them. For cardholders interested in increasing their credit ratings or just want to stay informed, CreditWise is a helpful credit tool. Except for the secured card, many of the Capital One credit cards are for people with good to excellent credit ratings. Plus, you may not be attracted to the rewards programs that are part of many of the credit cards. For example, if you typically carry a balance, credit cards with low interest rates might be better options. If you don’t find a Capital One credit card that fits your needs, we recommend checking out one of our lists of the best balance transfer, low interest, travel, or cash back credit cards, to find the card that works best for you.